For a backpacker, a mess kit one can rely on is not a luxury, it is a necessity. It determines how smooth and comfortable the backpacking trip will be. Primary considerations include weight, inclusivity, and size. A backpacker needs a mess kit that is light enough. The lightweight ensures the backpacker doesn’t hurt his/her back. A backpacker also requires a comprehensive set that can handle varying situations such as changing menus, or an extra guest. 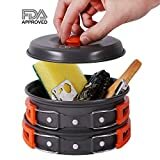 Finally, they need a backpacking mess kit that is small enough to comfortably fit in the backpack while occupying the minimal amount of space (Source). 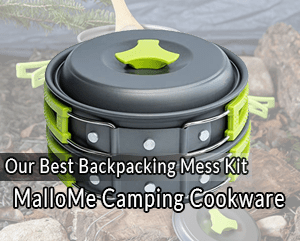 Numerous backpacking mess kits fulfill all these requirements. If you are trying to find one, here is a review of the top five backpacking mess kits for this year. With close to 3200 reviews and over 95% of them positive, this MalloMe Mess Kit is one of the best options available in the market today. It takes all your backpacking needs into account and provides for them. To start with; even though it is a 10pc mess kit, it only weighs 14.4 ounces or 0.9 pounds. 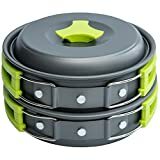 This kind of weight is a backpacker’s best friend because it reduces the packing headache and helps guarantee you won’t throw out your back due to the extra weight. The ten pieces include a 1-liter non-stick pot, a pot cover, a non-stick pan, 2 BPA free bowls, a folding stainless steel spork, a BPA soup spoon, a wooden spoon spatula, a cleaning sponge and a nylon drawstring pouch. The pot’s folding handles contour to the pot’s shape when not in use. Such kind of folding makes the kit compact and easy to pack. There is also the fact that these pot handles and pretty much the entire set are sturdy. The toughness ensures that if you take care of the kit, it has the potential to last for a long time. The little fry pan and saucepan nest into each other and the bowls are a great portion size for camp meals. When not in use, the mess kit collapses into a small manageable bundle. The pouch holds this small collapsed bundle nice and snug allowing you to stuff it into your backpack for easy transport. It is essential to note that the cooking ware is made from FDA approved Anodized Aluminum. That means it is non-toxic. The only noticeable concern is that due to the plastic handles, the kit might not be suited for open-fire cooking. It is a valid concern, and it requires that you keep the handles away from the flames and ensure the fire does not wrap over the lid. If you are using a camp stove, then this not a concern. The kit is lightweight and hence extremely mobile. Easy to clean and it heats fast facilitating fuel consumption. The mess kit comes with a free eBook. The lids lack a locking mechanism, and as a result, they rattle when in transit. A list of the best backpacker mess kits is incomplete without a GSI Outdoors product. GSI Outdoors have been leaders in the industry for years and true to form, this Pinnacle Backpacker Nesting Cooking Set does not disappoint. While a little on the pricier side, it makes up for it by incorporating everything you need for your backpacking trip while maintaining a reasonable weight. The whole kit weighs approximately 1.8 pounds. While 1.8 pounds is a bit heavy compared to other lightweight kits, one should note that it is made up of eleven pieces and is fully equipped for two people. That is unlike other kits that can only cook for a maximum of one person. The eleven pieces include a 2-liter pot with a strainer lid, an 8” frying pan, two mugs, two nesting bowls, two sip-through lids, a folding pot handle and a waterproof stuff sack. It is incredible that everything fits in this waterproof stuff sack which once unpacked, can be used as a sink for cleaning up after eating. The unique design makes cleaning up extremely easy. When packing, the mugs do not occupy the entire pot volume, and that means there is an extra space that can fit your fuel canister. However, please note that this kit does not come with a fuel canister and you have to purchase this separately. The Teflon non-stick coating on the pot and the pan facilitate even heat distribution. Also, the coating is three-layered to ensure the kit is sturdy enough and can withstand the toughest of conditions. Finally, the pot has exterior brackets that allow the gripper locks on the folding handle to lock on and provide secure handling when cooking. That means you need not be scared of freak accidents. Note that similar to the MalloMe Mess kit, it is not advisable to use this kit over an open fire. A high-quality and durable mess kit. An all-inclusive kit that makes it possible to cook a wide array of super involved meals. The Halulite Microdualist Two-Person Cook set is another GSI Outdoors product. Similar to the #2 mess kit discussed above, it maintains the high quality the brand is known for but with the added advantage of being lighter and less pricey. The entire set comes in at just 1 pound. It is the best minimalist kit because it whittles down the pieces making up the mess kit to a bare minimum without compromising on inclusivity. That means you will still have everything you need without the extra weight. The 1.4-liter pot has a perforated lid that can act as a strainer. As a result, the pot and lid combination is ideal for a wide range of meals. The size of the pot is perfect because it is just big enough for two people. The kit also includes a unique mug and bowl combo complete with two sip-through lids. The combo saves on space, and the lid ensures spills are almost non-existent. When the kit is fully nested, the handle collapses on top of the pot guaranteeing a snug and secure fit. Note that the material used in the design of this set is Halulite. The proprietary alloy from GSI Outdoors is as light as titanium, and it conducts heat better and more evenly than titanium. Consequently, you save on fuel. Also, all the pieces are hard anodized, creating a surface that is scratch and abrasion proof. The final piece making up this set is the welded stuff sack that duals up as a sink. The material used is an excellent conductor of heat. It outperforms Titanium. Though only 1 pound, the set is still big enough for two people. The mess kit is affordable. Not ideal for cooking over an open flame. At only 0.57 pounds, the REDCAMP camping mess kit is one of the lightest options in the market today. It consists of nine pieces—a non-stick frying pan, a non-stick pot, two bowls, one survival bracelet, a tool card, a spoon, a loofah sponge and a bag. Approved Anodized Aluminum is used on the nonstick pot and pan. That makes the cookware safe, toxic free and extremely easy to clean. Thanks to the Aluminum, both the pot and the pan are good conductors of heat which saves on fuel. Just remember you should keep the cooking handle away from the gas canister for safety purposes. The folding spoon saves on space, and the two bowls can be used as both a mug and a bowl. The survival bracelet gives an extra layer of security in an emergency situation, and the tool card can perform a wide array of functions from bottle opening to cutting anything that needs cutting. When packed, the REDCAMP Camping Cookware set takes up the smallest amount of space possible. Actually, the height of the packed-up set is comparable to the height of an iPhone. All the nine pieces fit into an oxford bag. You can either put this oxford bag in your backpack or hang it. If you decide to hang the Oxford bag, then it means you have extra space for more items you might want to carry. The REDCAMP set is ideal for a solo hiker or backpacker because it so light one can barely feel its weight. The medium-sized nature of the pot also supports a solo hiker. The set is extremely lightweight. The kit is of high quality. The kit has a one-year warranty. The kit does not come with a stove. The small capacity ensures it is only ideal for one person. The distinguishing aspect between this mess kit and the others discussed is that it is ideal for group camping. The 2.5-liter pot makes this possible. In total, the kit has seven pieces and all the pieces nest into the pot. First, there is the large 2.5-liter hard anodized pot. Note that this pot is not coated. That means it is ideal for boiling water; either for drinking or for use in preparing any other food. It has a strainer lid that can be used to stew or strain water from food. It is also large enough that it makes a great wash basin. The next piece is a 1.5-liter nonstick pot. It shares a handle with the larger pot, which means you cannot use both pots at the same time. The size of this pot makes it ideal for cooking for a smaller group. The pot is easy to clean, it is an excellent conductor of heat, and the anodized outer surface ensures it is resistant to rusting. Third, there are two deep dish plates. Though plastic, they can withstand a lot of heat without warping. The plates are high walled and hence capable of holding roughly 0.8 liters of water. The high walls eliminate spilling and make it simple to move or sort your food. The two double-wall insulated mugs complete the set. They are also plastic but heat resistant. The mugs have lids that prevent spillage and a small mouth port that discourages insects. Note that because of the weight, the set is not ideal for a solo backpacker. The complete set weighs about 2 pounds, but when traveling as a group, you can easily share this weight. The set is a bit pricey thanks to its size, but its quality and functionality more than make up for it. Perfect for a large camping group. Purchasing a mess kit goes beyond knowing the best options available in the market. There are significant things one ought to consider. When purchasing a backpacking mess kit, you do not want a kit that will break down after two or three trips. That is not only a waste of money it is also inconveniencing. Also, you need to remember that a camping environment is sometimes rough. Therefore, you need a kit that can take some knocks and still survive. One key thing that determines durability is coating. There are also other factors such as the brand. The purpose of a kit is a significant consideration. Take for example the MSR Quick 2 System discussed above. If you are the kind of backpacker that prefers hunting and gathering food on the way, then this set is ideal for you. That is because it is large enough to allow you to modify menus on the go. However, if you prefer to plan out meals in advance, then this is too much weight for nothing. Therefore, anytime you are embarking on a mess kit purchase journey, first determine the kit’s purpose. Do you want it as your primary backpacking kit? Is it for individual or group trips? 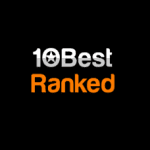 Only after answering these questions will you be able to pick out the best kit for you. The weight of the mess kit will determine the kind of trip you take. 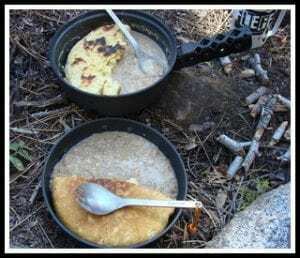 If it is pure backpacking trip with no motorcycle or car rides in between, then it is prudent to have the lightest possible mess kit that still has all the necessary amenities. Consider the #2 and #5 options discussed above. They are not ideal for an extended backpacking trip thanks to the weight. You might hurt your back or find it impossible to go the distance. However, all the others are either one pound or less and will work perfectly. Always determine a kit’s weight and compare that with the kind of backpacking trips you wish to take before purchase. The above guide mentions the essential features of each mess kit, the number of pieces making up a set, and the kind of trip each set is ideal for. 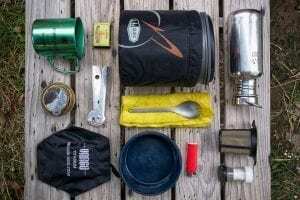 Once you take the noted considerations into account and you keenly go through the list of the best backpacking mess kits available in the market right now; you’ll be in a position to make the best possible decision.